Conrad Schnitzler - "Conal 2001"
Most followers of early Kraut electronica could inform you that Conrad Schnitzler was once a member of Tangerine Dream way back in the late 1960's. His time with the band was short and he was only featured on their debut album, Electronic Meditation, before leaving to form the band Kluster with friends Moebius & Roedelius. As Kluster they released three albums before Conrad again left the band to pursue solo projects under his own name, and has been recording and performing ever since. Conal 2001 is over an hour-long voyage through the various phases of electronic sound canvassing. It is made up of three tracks and each flows in a demented almost chaotic form. As with most synthesised works there is a lot of room to produce soundscapes geared for the mental involvement of the listener, and Conrad Schnitzler on these pieces does just that. The track titles are the track lengths and the first is 18.55. It invokes very Tangerine Dream like structures, it gets straight into the business of chaotic sounds from the off, but it is a mellow chaos. It is similar to some Edgar Froese solo stuff and as with this type of material you either love it or hate it. If you have ever heard of Conrad Schnitzler, Edgar Froese or Klaus Shulze then I'm sure you could guess what sort of atmosphere it casts to the listener. It is very intense in parts and it spans 18.55 with assorted mood changes shown though the eyes of sound. You get the picture? Track two, 20.33, has a nice bass sound pulsing in the background whilst the foreground is awash with chaotic tension building that could be a horror film music score. It is strange and encompassing to the ear. 20.33 lapses into mellowness as the bass disappears and a new vibe takes over. Once again it is electronica so it is full of different twists of sound. I will say that Track three is my favourite, it begins quietish compared to the first two tracks, and it is not as harsh on the ear. Even though some parts are crazed, in essence they are built with atmospheres that I find meditative when listening through headphones however hectic it may become. The sounds are layered to produce a very well constructed piece. Beware, it can grow on you. 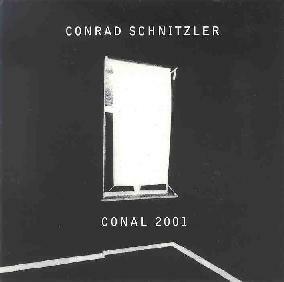 Conal 2001 is a must for Conrad Schnitzler fans and for those of you who fancy a bit of acid induced chaos. I'll say no more. For more information you can visit the Submergence web site at: http://www.motherwest.com/submergence. Contact via snail mail c/o Submergence; 132 W. 26th Street; New York, NY 10001.